All I can say is this is particularly apt today. Working to finish all my revisions before a 3-week trip to Asia. Must finish in the next week or no Bali for me! There is nothing in the world I enjoy so much as reading. Even the highest moments of writing pale in comparison to being lost in a truly good book. But reading isn't just a way to pass the time. As a writer, it's absolutely essential. Read extensively, read diversely, and it's like a free MFA program (MFAers might disagree with me, but it's what I tell myself, anyway). Personally, I also think it's important to not limit yourself to GREAT LITERARY WORKS. Read everything! Every book can teach you something, even if it's what not to do. Many extremely successful writers have stressed the importance of reading to become better at your craft. For today's Friday Writing Inspiration, I pulled together some favorite quotes about why reading rocks, especially for a writer. Enjoy! Happy Friday! This quote needs no explaining. I'm close to finishing the first draft of my WIP, so this is both inspiring and appropriate. P.S. There's still time to get The After Girls for just $1.99. Check it out here. Happy Friday! I usually post a quote that I find inspirational, but today, I'd rather share an Australian artist who does the same as me, but does a much much better job. I first discovered the work of Gavin Aung Than when a fellow writer linked to this incredibly inspiring post on Facebook. Gavin explores, among other things, the struggle artists creators (and hell, humans) have in adapting to a corporate life. As a fiction writer with a day job, I can definitely relate. But more than exploring the corporate world, Gavin turns some of my favorite inspiring quotes about things like making art, being kind, respecting others and making the most of here and now like no one else. While these are other people's quotes, Gavin creates his own story around them--and in this case, the whole really is greater than the sum of its parts. Above is one of the free posters Gavin shares when you sign up for his newsletter. I definitely recommend it! That's definitely me this weekend, hiking around the frightening wilderness of my mind, club in hand and desperately trying to turn my novel idea into a full novel (coming up on the 1/3 done point!). 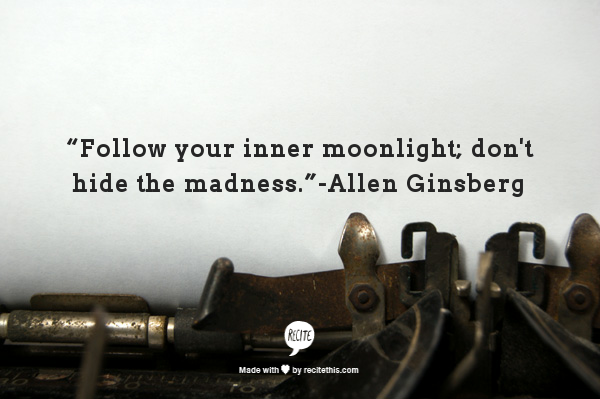 Now that I've dramatically discussed my writing process, hope you can glean some inspiration from this awesome quote! Happy Friday and happy writing! Happy Friday! I am blessed this weekend to have a lovely friend in town, so it's unlikely that I will do quite as much writing as I really should. But either way, how true and awesome is this quote by the great Stephen King? I once explained to my boyfriend (a great lover of non-fiction) that I thought, in a lot of cases, fiction has a greater impact than non-fiction. Essentially, it is truth (at the least good fiction is), just delivered in a package we can all relate to, connect with and understand. News and opinion and 24-hour cable and Twitter updates may make us a little crazy, it may make us all un-friend each other on Facebook and argue about the events of the day. This week has proven more than anything that it may polarize us, and that when we're in news mode, we are often unable to see things in a new light and be open to other points of views. Not saying non-fic isn't incredibly important, but in some instances, I think fiction and drama can be far more powerful, and instead of dividing us according to issues, it unites us through emotions and relationships and pages and pages of mini-truths that we can connect with. Those are my thoughts, at least. Happy Friday, and happy writing! This is perhaps the truest writing advice I've ever seen. Happy writing!